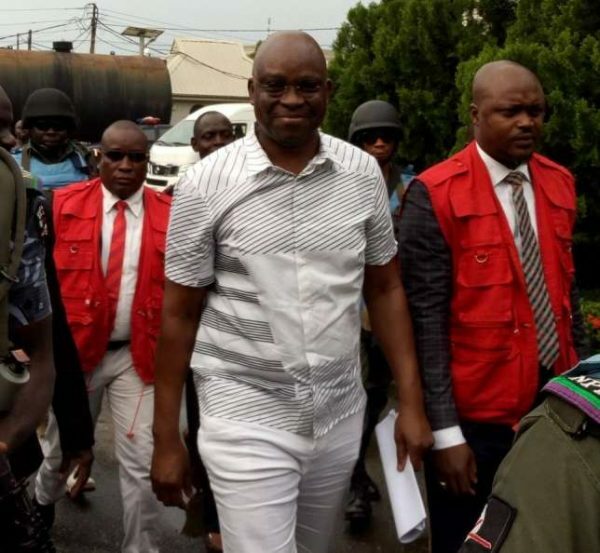 Ayodele Fayose, the immediate past Governor of Ekiti State has been granted bail in the sum of N50 million. His bail application was granted during his second appearance before the Federal High Court sitting in Ikoyi, Lagos, on Wednesday. The judge also asked him to provide a surety who must have landed property in Lagos. The guarantor is also required to have three-year tax clearance in Lagos. Fayose is facing an 11-count charge bothering on receiving illegal monies to fund his 2014 governorship campaign in Ekiti State, among other allegations of benefitting from proceeds of money laundry. The post [BREAKING] Court Grants Fayose N50m Bail appeared first on LATEST NIGERIAN NEWS BREAKING HEADLINES NEWSPAPERS.